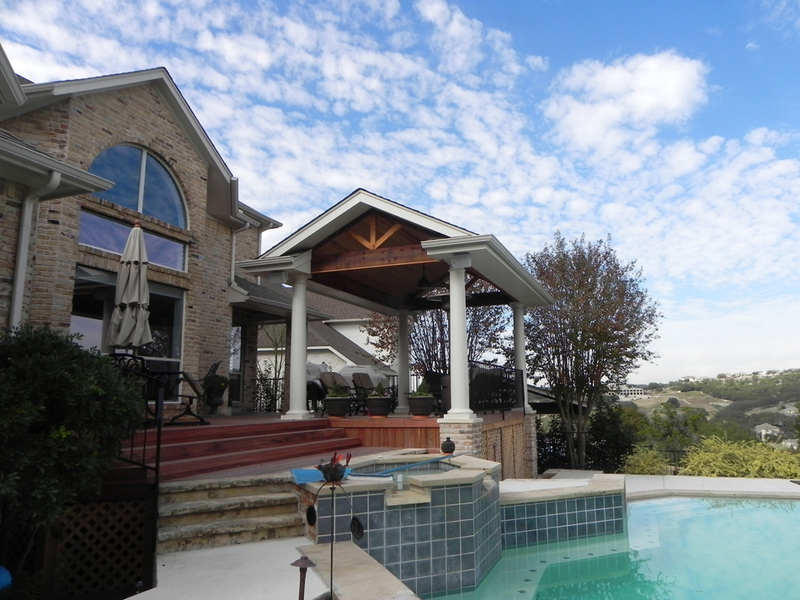 Custom features abound in this Austin, TX, elevated outdoor living space! 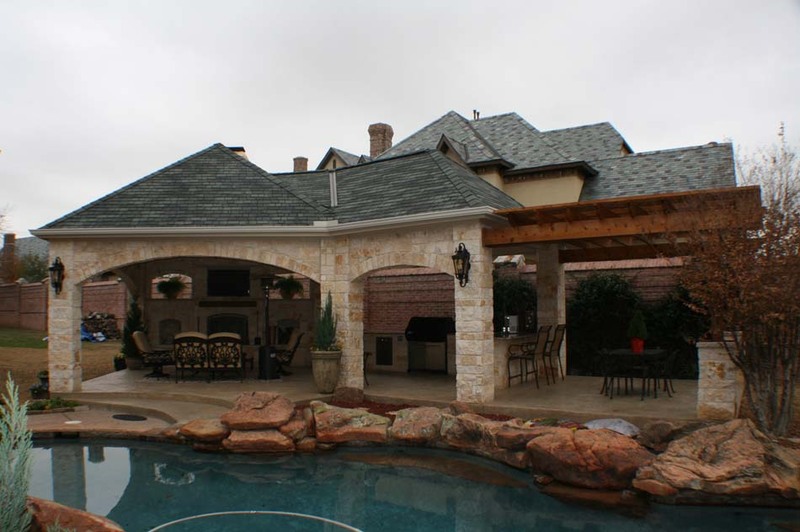 Have you wondered what it would be like to have an outdoor living space that was designed to cater to your every outdoor living need? For instance, having the perfect spot for outdoor dining, a respite where the views exceed your expectations on a daily basis or an oasis that is as functional as it is beautiful, day or night? 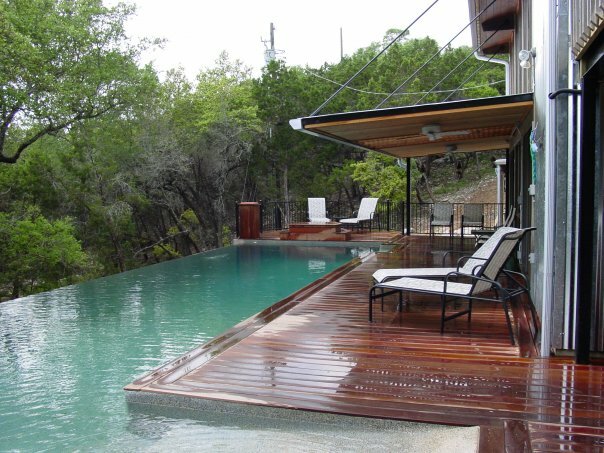 This is exactly what these Austin, TX, homeowner’s got when they hired Archadeck of Austin to design and build their elevated deck and porch. This spacious outdoor living space consists of an elevated, 2nd story low-maintenance deck and covered porch area with all the trimmings! 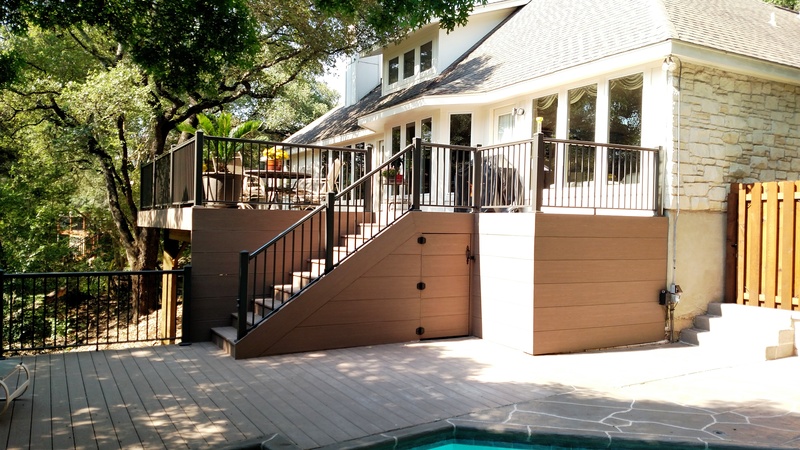 The deck was built using Fiberon Horizons decking in Tudor Brown. 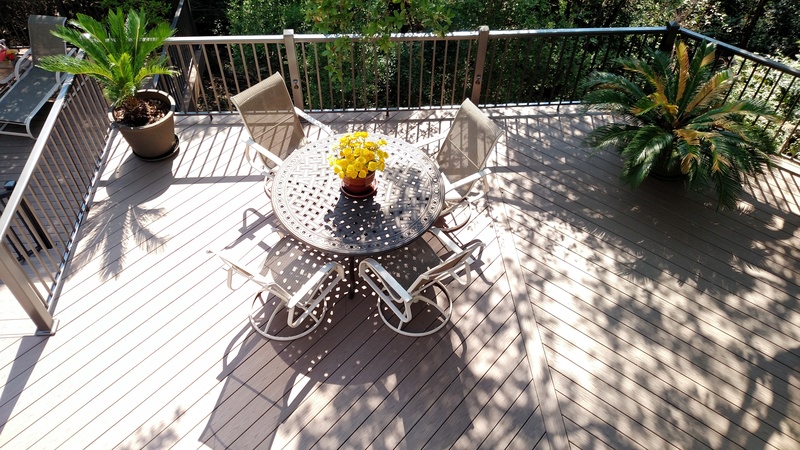 Horizon decking is capped (or covered) on all four sides with a patent-pending PermaTech® surface material. Four-side capping increases durability, enhances stain and fade resistance, and ensures a more polished appearance all around. 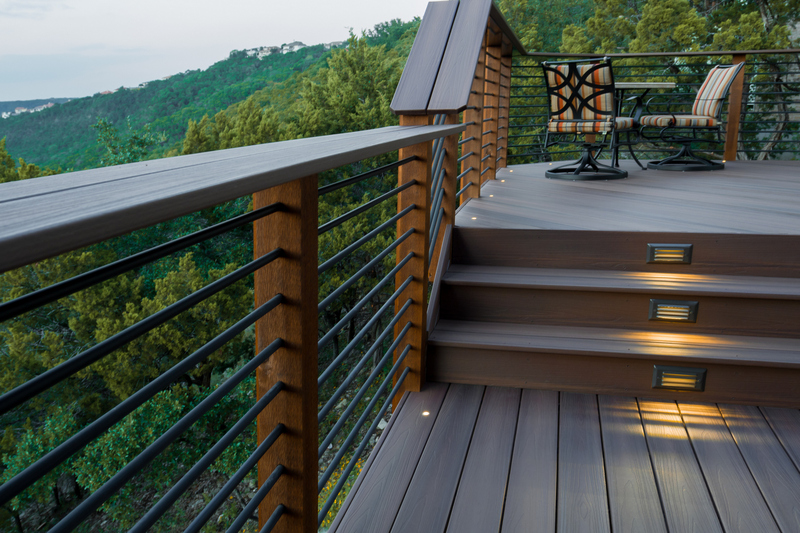 Plus, Horizon decking features two different wood grain patterns on the top and bottom to add more character to your deck design with less on-the-job waste. 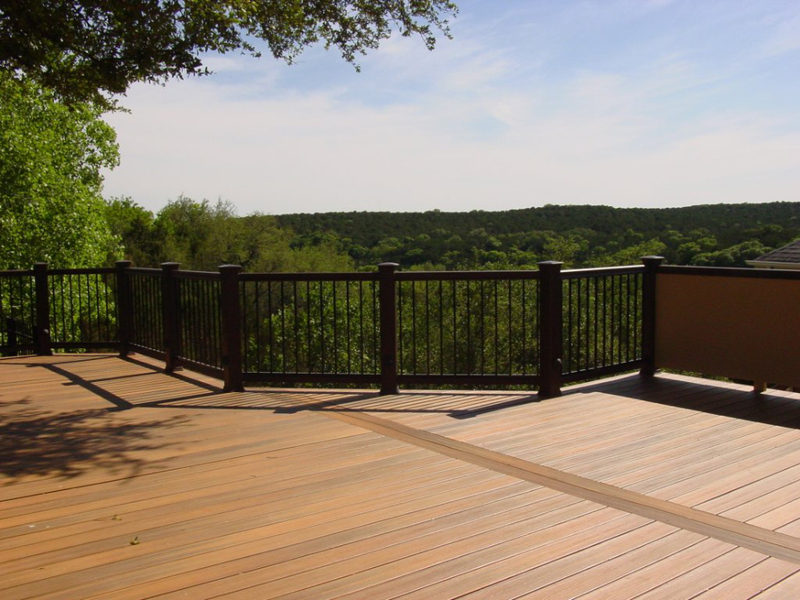 In addition, Fiberon decking requires no sanding, staining or sealing , ever. This means less worry over maintenance and more time to enjoy the finer things in life! 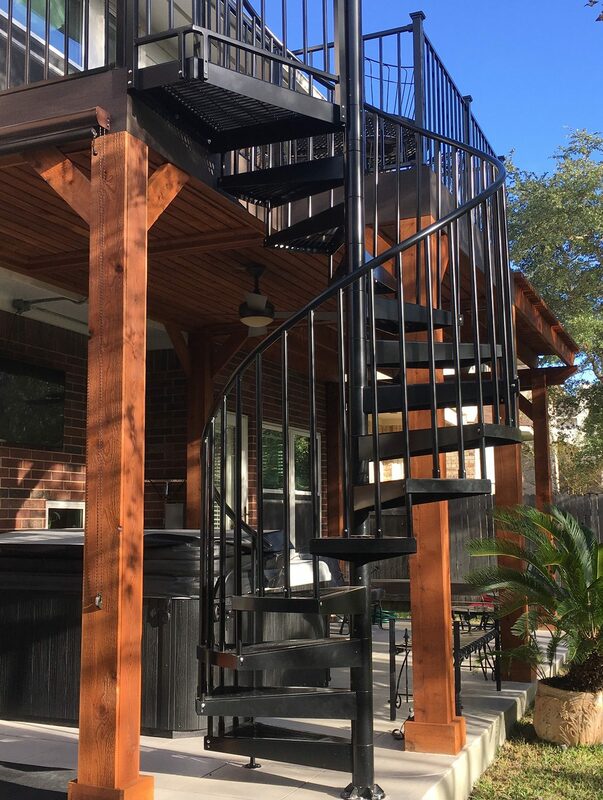 The beautiful deck is accented with custom-designed and constructed horizontal tubular railing that has been powder-coated black. 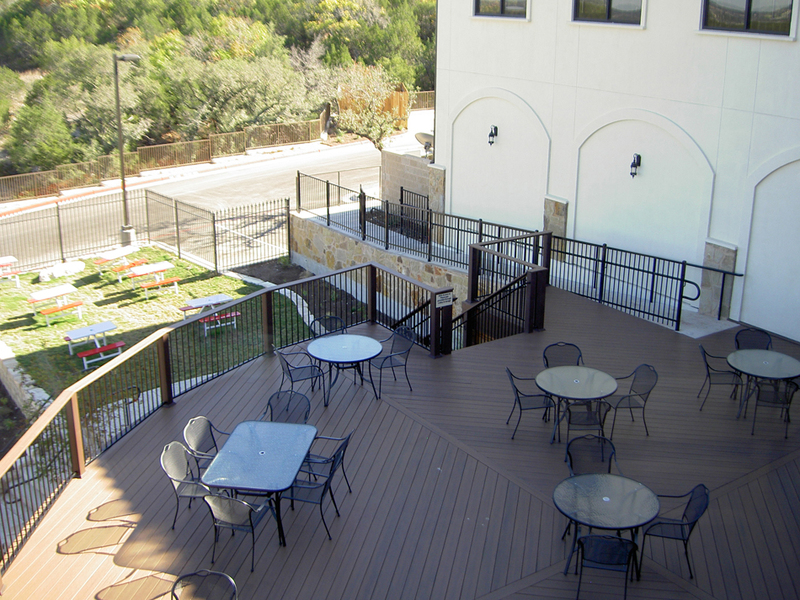 Atop the railing, and expanding the entire perimeter of the space, Archadeck of Austin installed a double composite cap offset within with a super strong fabricated steel plate to prevent climbing on the railing. 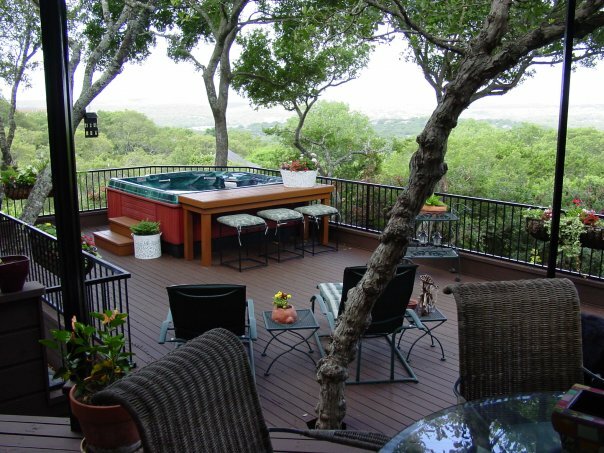 In addition to the safety factor, the double cap also serves as a luxurious bar area to use as a drink ledge measuring out to 11″, and is even large enough, standing at 42″, to pull up a bar stool and double as a impromptu spot for dining, conversation or enjoying a beverage while taking in breathtaking views of Austin proper. We took the abundance of custom features a step further by designing and building integrated bistro-style seating out of the same composite used on the deck around the cedar posts of the covered porch portion of the space. 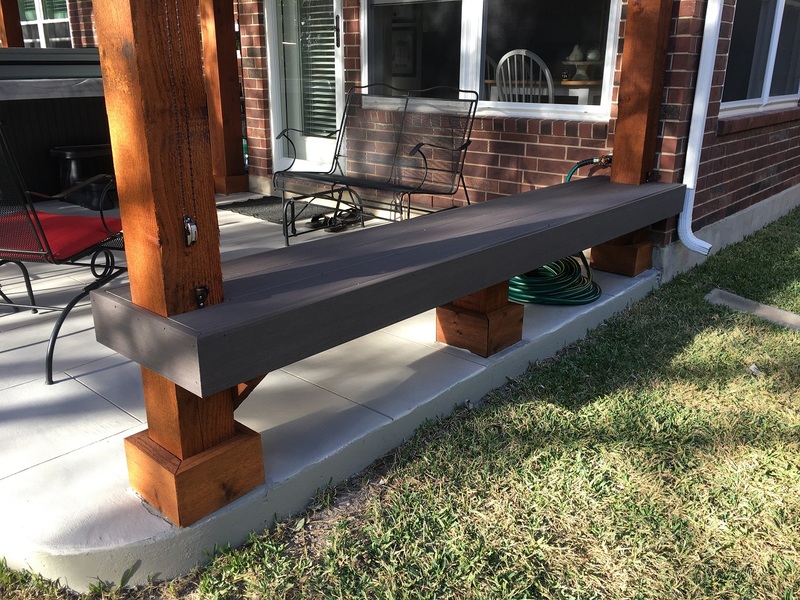 We even designed a built-in bench for additional seating when entertaining friends and family. Last cut certainly not least, this outdoor living space picks up where other designs leave as an afterthought — evening enjoyment! The entire space is loaded with romantic LED outdoor lighting to aid in utilizing the space to its fullest potential in the evening, and creating ambiance. These Austin homeowners are elated with their new space. They view it as an all-inclusive escape that is close as just a few steps out the door! With everlasting views of the beautiful Cat Mountain, the backdrop to outdoor living enjoyment knows no end — literally. 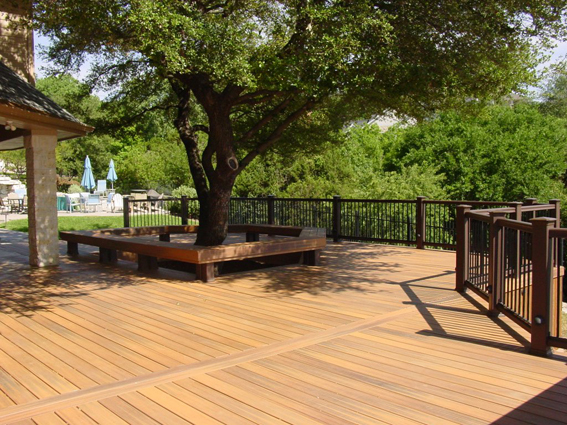 If you are interested in learning more about creating a slice of Heaven in your backyard too, contact Archadeck of Austin to schedule a consultation today at (512) 259 – 8282 or via email at jim.odom@archadeck.net. You can see more images of this project and many more of our stunning outdoor living designs by visiting our extensive galleries on Houzz. 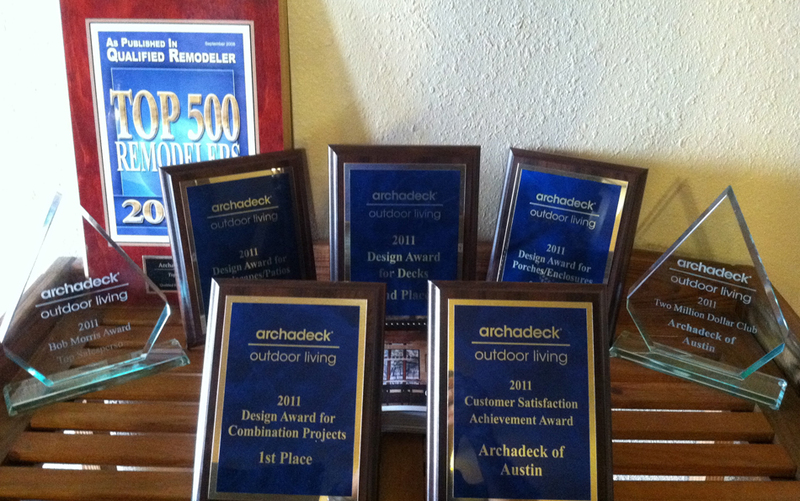 I have been in the business of outdoor structures for many years and there’s a reason why I keep doing it. I love building outdoor structures and seeing the positive effect they have on my customers lives. I LOVE designing decks. 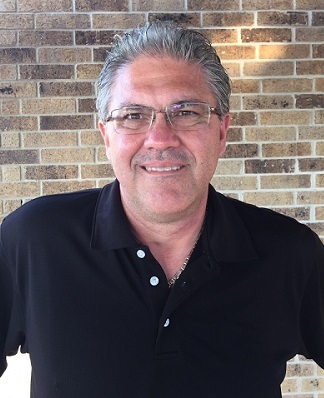 I have also learned a lot over the years by not only working with my customers but by keeping in contact with them as well. There are two things I really push for when my clients are making their decision. The first one is size. By this I don’t mean convincing someone who wants a 500 square foot deck to go to a 1,000 square feet. What I mean is measuring their furniture and seeing how much depth they really need so that the furniture can still be comfortable in the “pulled out” position, much like it will be after dinner and when your guests linger over coffee. People will pull out their chairs from the table and extend and cross their legs to enjoy the leg room that’s often needed after a wonderful and very filling dinner. You would be absolutely amazed at the difference that can be achieved by adding one or two feet of depth to a deck of patio. The second thing I am passionate about is the view. Here in Austin we have beautiful hilly terrains, mature trees in many places and other beautiful structures and details within our yards. 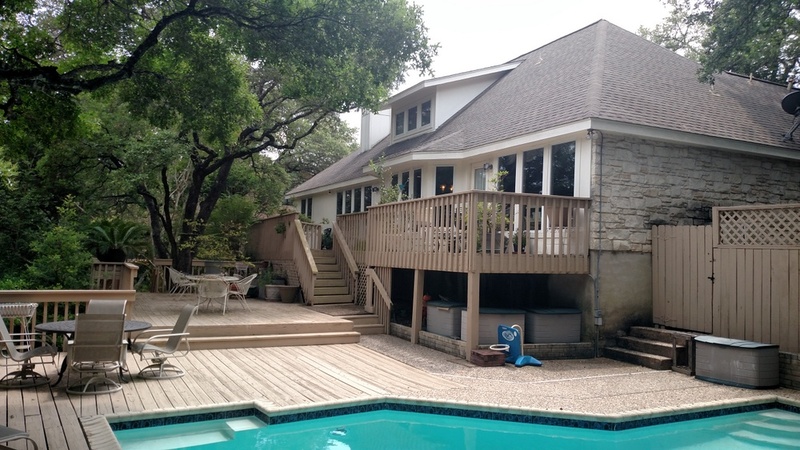 You may just want a good view of the backyard to watch the kids play. 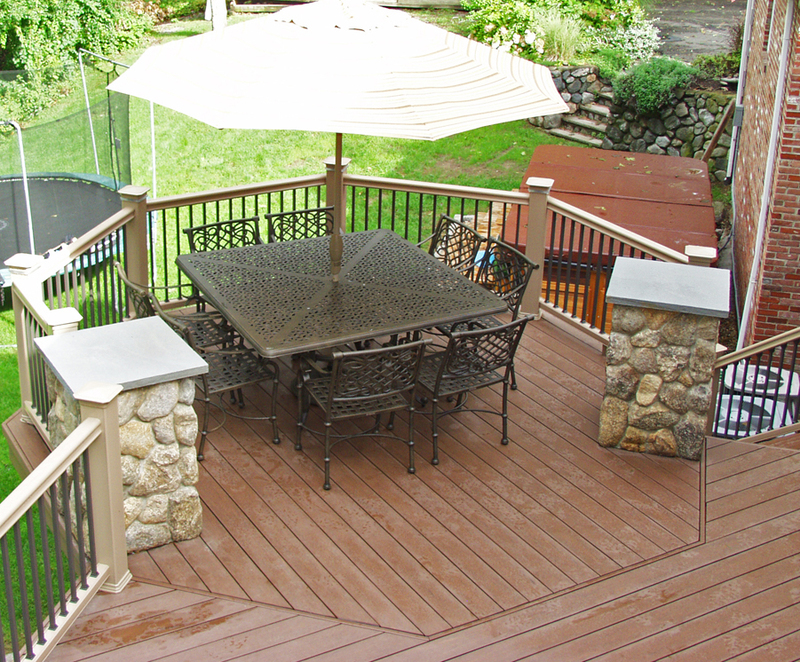 So often, people think that the only railing choice is one with thick and closely spaced pickets. This simply is not the case. 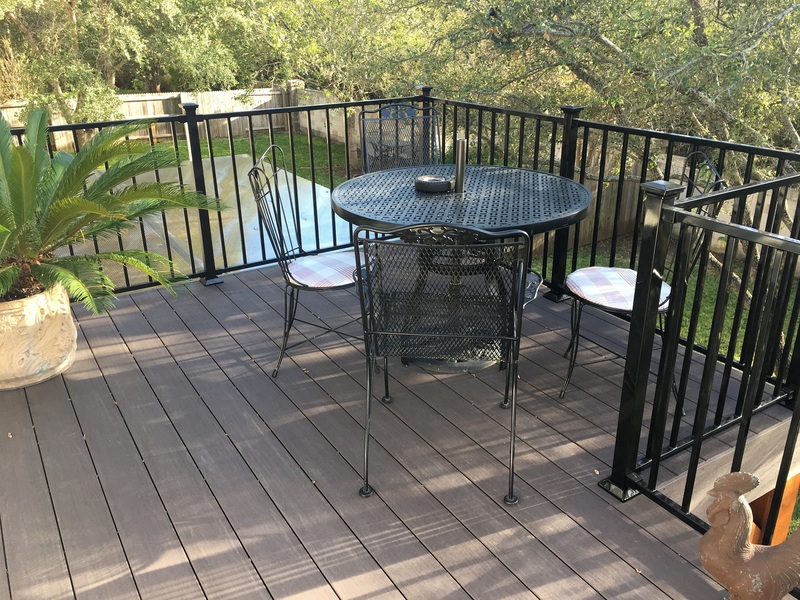 Metal railings are very popular these days because they have very narrow pickets that not only dramatically improve the view, but they also require less maintenance. 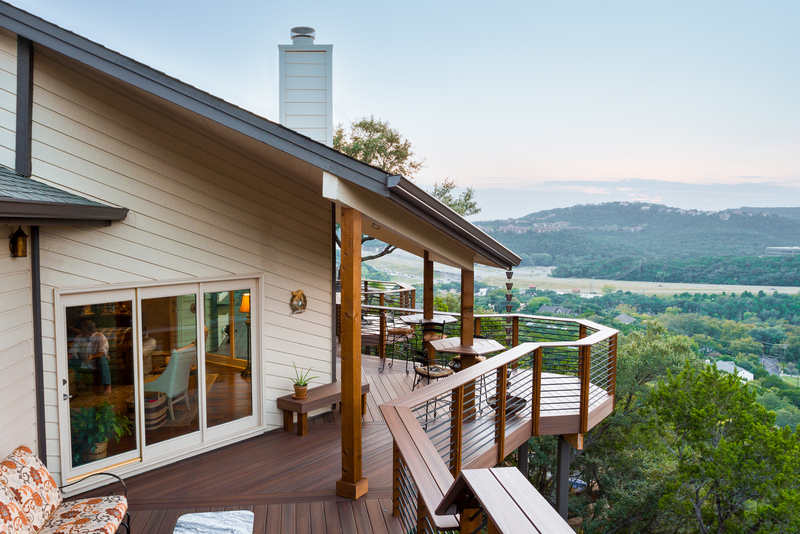 One such job where Archadeck of Austin was able to frame the view and offer plenty of linger and leg room was a deck we recently completed for homeowners in River Place, which is inside Austin. These homeowner’s residence overlooks a beautiful view of a canyon, unfortunately, a good portion of this stunning view was obscured. This was in part by the old deck having too many benches and the railing. Literally, when you were inside the home looking out, all you could see were benches. 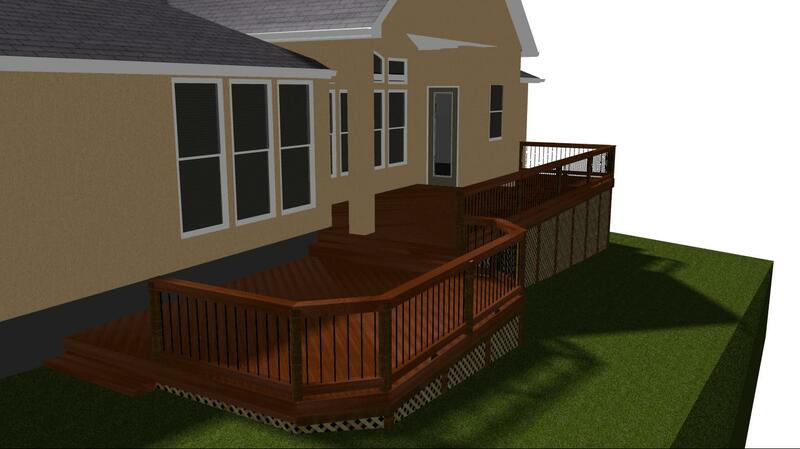 We aimed to change that for the better in our design and re-decking plan. We aimed to open up that view so the homeowners could relish the view. 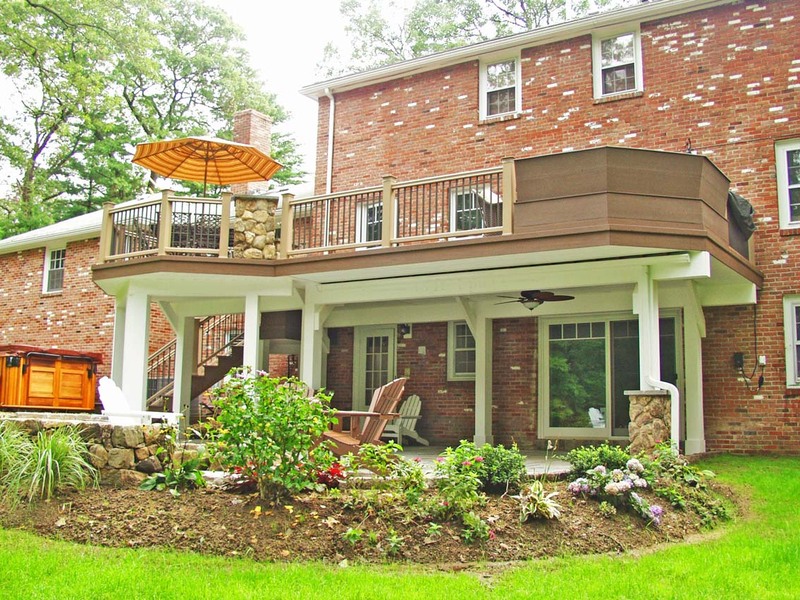 Since their home is so elevated on one side they also yearned for a little privacy on the deck as well. 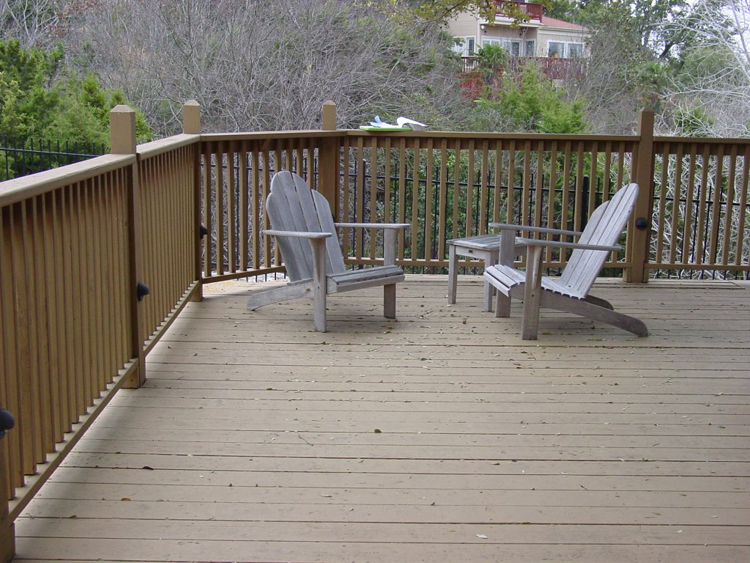 We were able to incorporate both with this new re-decking. Since the existing frame of the old deck was in such good condition we were able to immediately move forward with the re-decking. 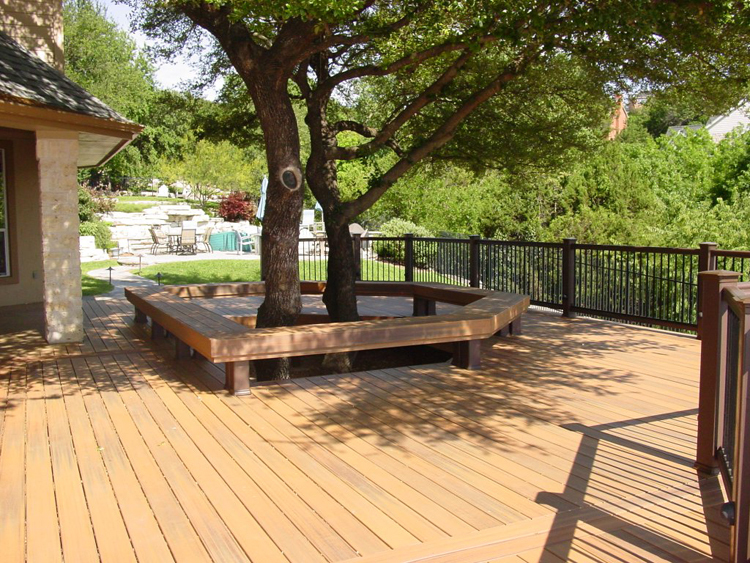 An older contractor had built a seat that incorporated the beautiful tree that was in the middle of the large part of the deck. We wanted to keep this in the design of the re-decking, because it gave the deck a personality and uniqueness all its own. 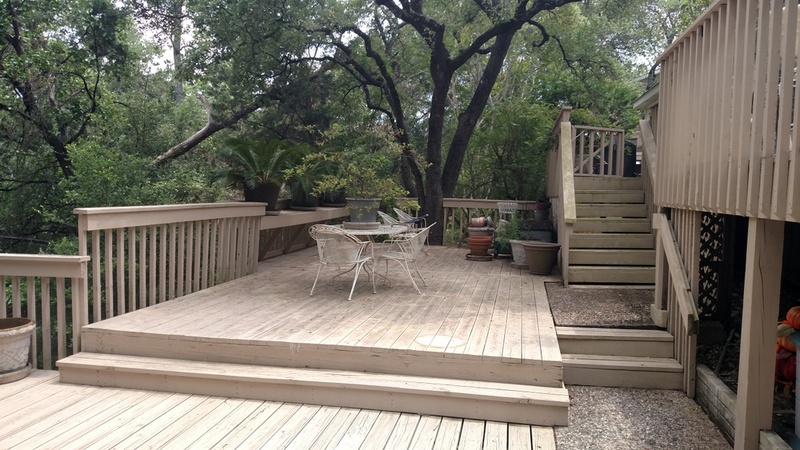 The deck is a massive 1,000 square feet and 5′ off the ground and in some places 11′ off the ground as well. The homeowners decided to replace the old deck with composite decking . 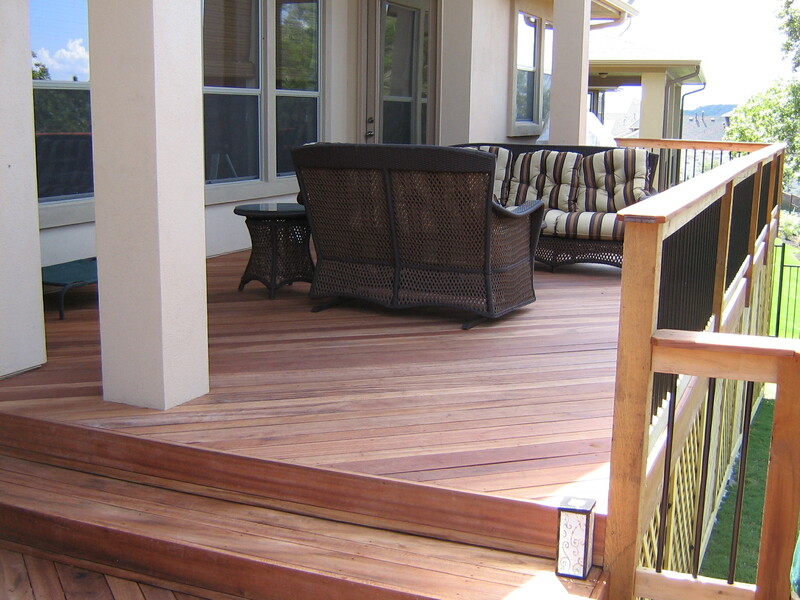 They chose the very desirable Fiberon Horizon decking in Ipe. Today’s composites have evolved to being spectacular and are virtually maintenance free. They have no open pores so there is nowhere for mold to grow, and plastic capped composites such as this can be cleaned with simple soap and water they pay for themselves in no time because of the lack of maintenance required on a deck like this. These materials have a 25 year manufacturers warranty as well. The difference in composites today as opposed to ten years ago is the difference between night and day. People still love the tranquility and natural look of a wood deck and this can now be captured with today’s composites. 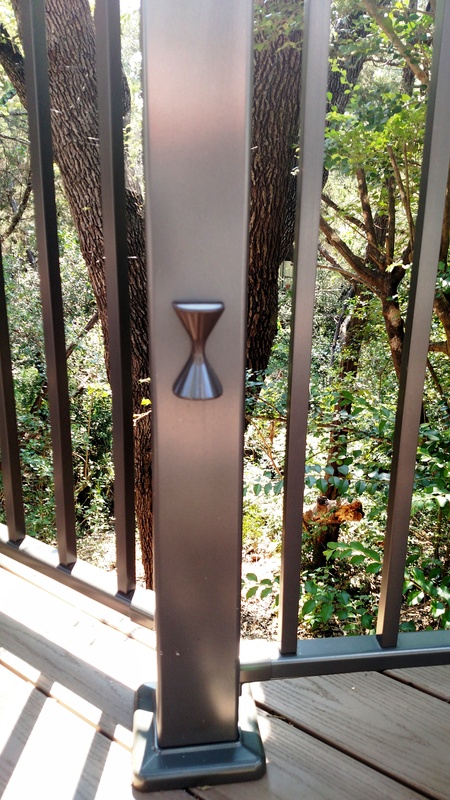 We finished out the new deck with a Radiant rail post with stunning Fortress iron railing. We still wanted to achieve a decorative effect so we used composite post sleeves, this allows the homeowners to “picture frame” the deck but doesn’t obscure any of the breathtaking view. 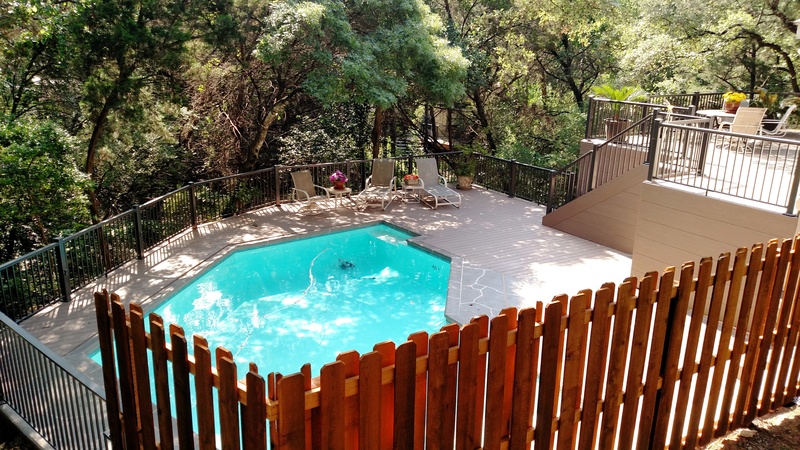 We removed the backs from the existing benches and used the iron rails to open up the deck so the homeowners can see the canyon as well as their lovely pool. 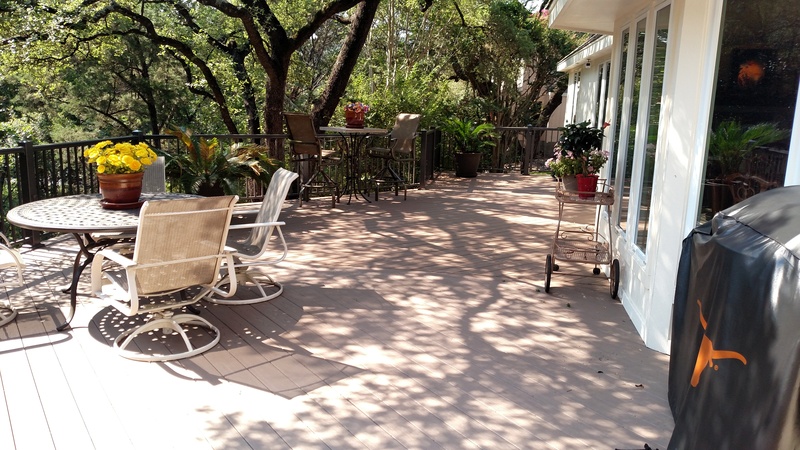 These Homeowners in River Place, TX now have the deck and view of their dreams, built out of hassle free, worry free composites. 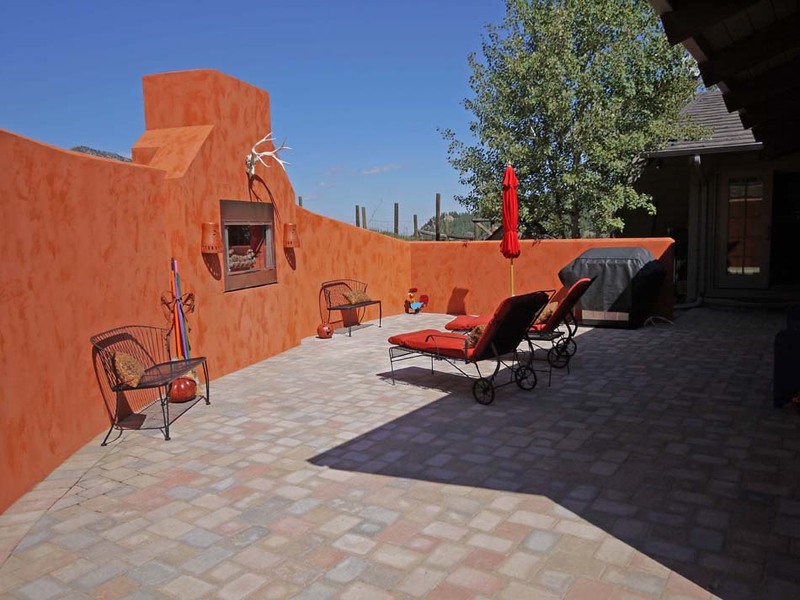 They have plenty of room for entertaining and quaint evenings overlooking the canyon for many years to come. It is clearly evident that style and elegance can be contagious. Within the Falcon Head West community of Bee Cave, TX nearly all the residents that live in the same cul-de-sac came down with the same symptoms, a yearning for the simple, elegant and classic sensibility which entails the desire to have a deck made of Tigerwood. 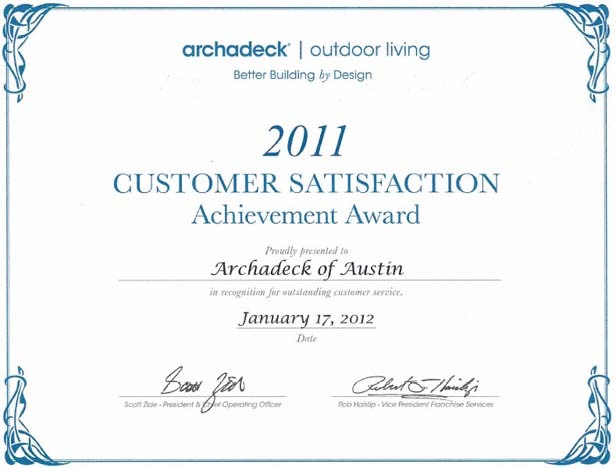 These homeowners in Bee Cave, TX contacted Archadeck of Austin when they initially built their home and once they closed on the house we began work right away on the deck when they moved in. It is always nice to have your entire home ready and waiting when it is time to move into your new house, including any outdoor structures. The Falcon Head West community is an upscale neighborhood in Bee Cave, TX and has a very hilly terrain. 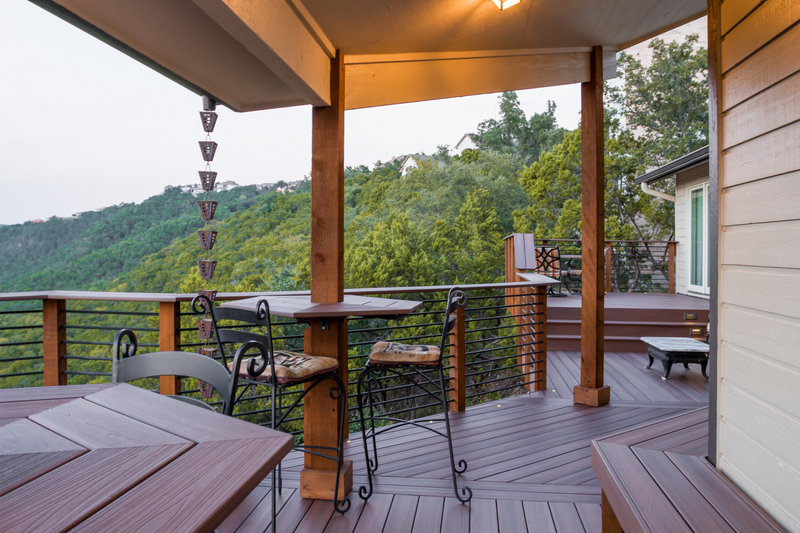 These homeowners decided upon a tigerwood deck because of its classic beauty and sensibility. 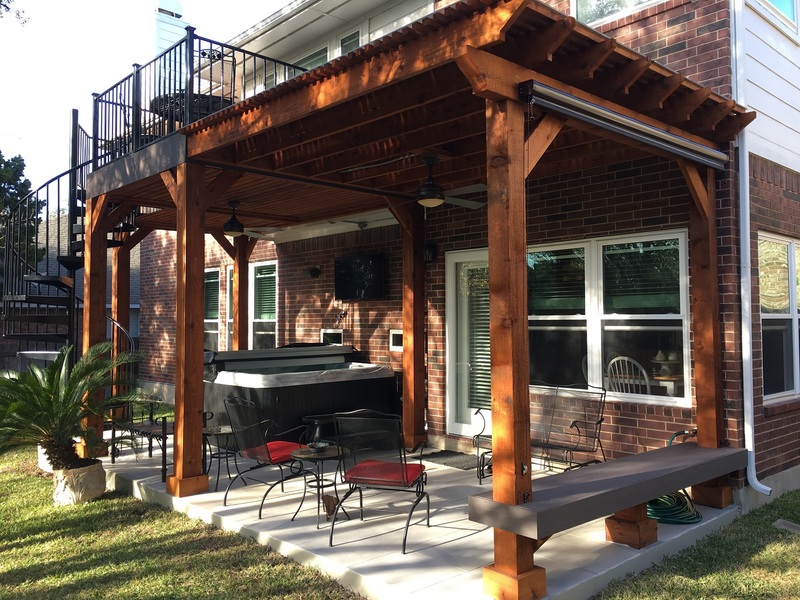 We built a two-story deck and decked over an existing patio with sleeper framing. 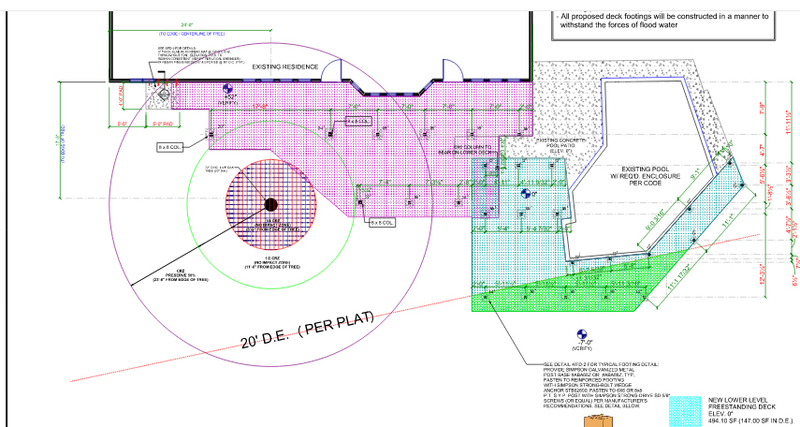 The final dimensions in length on this new deck came to a substantial 48′ long. 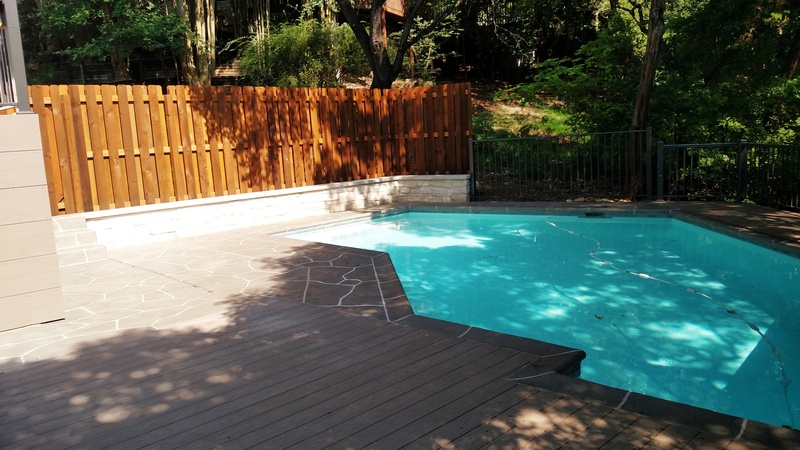 We installed the decking in a stunning diagonal pattern and alternated 4″ and 6″ boards for even more of a custom look to accommodate the varying widths. 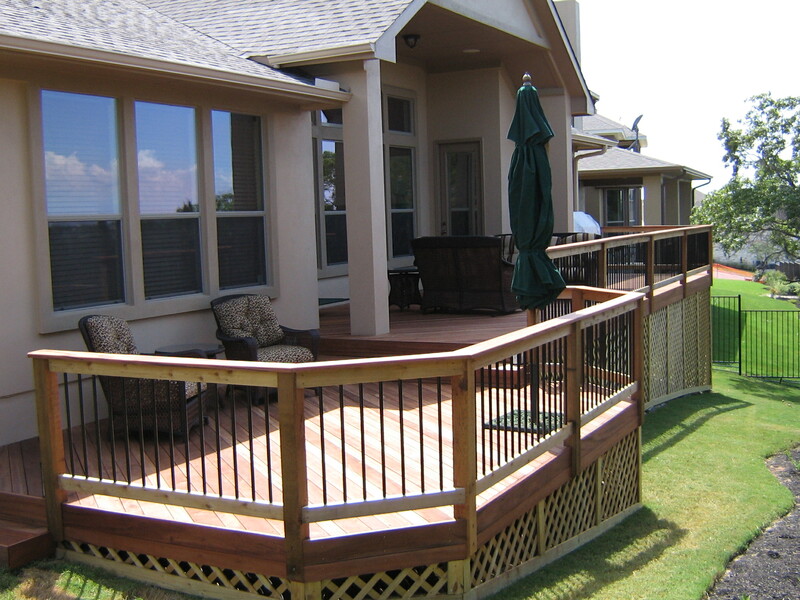 The railing is a tigerwood Deckorator panel rail which we constructed on site with black aluminum pickets. We finished up the structure with lattice skirting because this is a requirement within the neighborhoods HOA (Home Owners Association) guidelines. The homeowner opted to stain the new deck himself. Upon completion of the new deck, four of this homeowners neighbors decided to add a tigerwood deck to their home as well. What is it they say about first impressions? 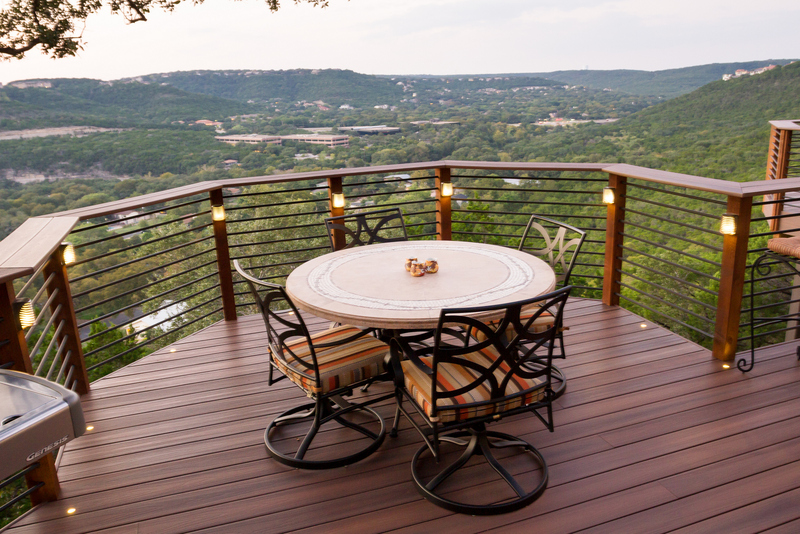 Choosing a tigerwood deck not only adds beauty to your home with the woods natural rich and exotic hues, tigerwood is an example of classic fine wood at it’s best. Old man Webster defines a tiger as a large, carnivorous, tawny-colored and black-striped feline. The definition of wood is the hard, fibrous substance composing the stem and branches of a tree or shrub. Now what do you think you get when you mix the two together? The result is Tigerwood, astronium lecointel, one of the finest quality hardwoods available. 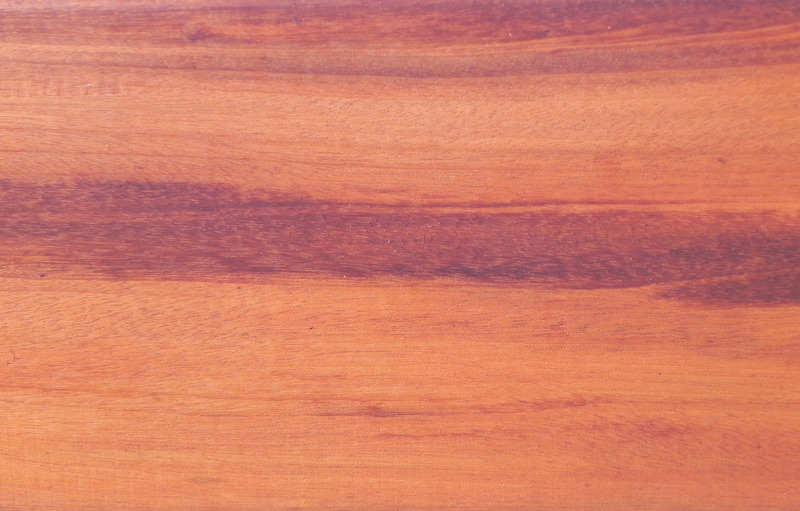 Tigerwood is an exotic and extremely durable Brazilian hardwood. One of the most striking features of this wood is the unique golden-brown to reddish-brown coloring with exotic black and brown streaks, as fiercely beautiful as it’s namesake. Over time these hues will deepen adding warmth and more depth to the coloring. Not only coveted for it’s beauty, Tigerwood is naturally resistant to rot and decay. It also will not attract mold or fungus. This wonderfully resilient wood has a lifespan of over 25 years without preservatives. 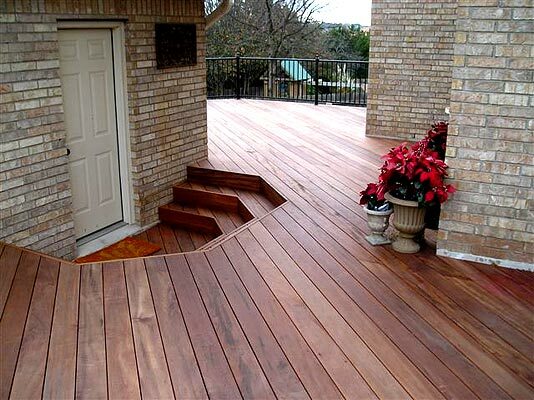 Archadeck of Austin is proud to be able to offer this product to you for your decking and outdoor structure needs. We have been working with this wonderful Brazilian hardwood for sometime now, with great results. We only see close similarities in working with Tigerwood as we do when we use Ipe. We are also excited about this product because of the “green” aspect of the harvesting. Tigerwood is only harvested from responsibly managed forests so we can offer a truly renewable resource to you, the consumer. 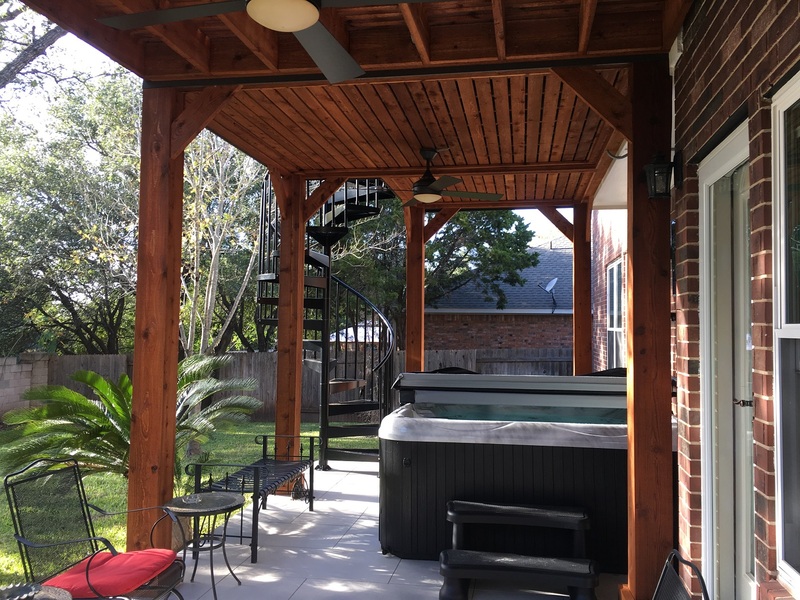 If you would like to find out more about the many places you can use Tigerwood to beautify your surroundings or if you have already decided to use Tigerwood on your deck or upcoming outdoor endeavors, give us a call. We can help you grab the tiger by the tail and become king of your jungle.